Before diving into the nuts and bolts of our actual review, I wanted to stop for a moment and talk about the means and perspectives on how to best test Apple’s rather unparalleled tablet. In terms of mechanical benchmarks, the path is rather straightforward – almost frustratingly so. 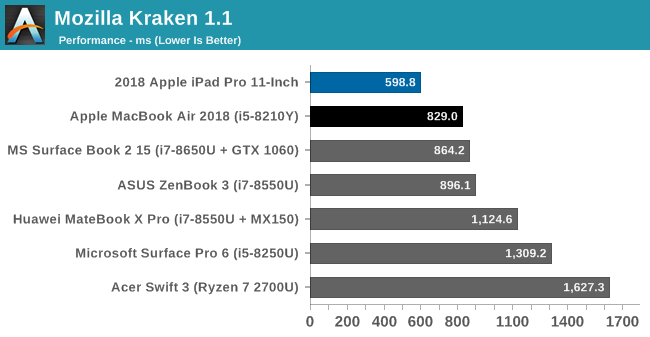 There are only so many decent standardized benchmarks that run on the iPad Pro, and even fewer of those that overlap with other operating systems, particularly windows. This is why, as atypical and throughput-focused as SPEC is, it remains one of the better tools for determining how the hardware compares to other devices. However when it comes to the user experience, that’s another matter. The iPad Pro is an iPad, that is also Pro. Specifically, that it has been designed and is being specifically pitched not only as a tool for the iPad’s traditional content-consumption tasks, but also professional productivity use cases as well. Document editing, content creation, photo editing, and other tasks that while not outside of the realm of a regular iPad, aren’t really its forte either. Since there aren’t really any other serious Arm-based tablets of the iPad Pro’s caliber on the market – Android seems to slip farther and farther behind every year – for the review of this year’s significantly redesigned model, I’m opting to approach matters from the other direction: how does it compare to traditional productivity machines. This is the market occupied by the likes of the Microsoft Surface Pro and other Windows-powered convertibles; devices that have brought the Windows experience to a tablet-like form factor. And while the overlap is by no means perfect, I do feel that these sorts of devices are the standard-bearers for productivity and professionally-oriented tablets on the whole. So at least in my eyes, the real competition for the new iPad Pros is going to be these other pro devices, rather than a smattering of large-format Arm-based tablets. And these are the sorts of devices I’m primarily going to be looking to compare the iPad Pro against. There’s little doubt that Apple has crafted a great SoC with the A12X, offering an eight core CPU for the first time in an iOS device. Apple claims that the iPad Pro is more powerful than 92% of the available laptops in the market. It does this in a device that is thinner, lighter, and much more efficient than any laptop on the market, which is a testament to their chip design team. The iPad Pro ships with up to 6 GB of LPDDR4X – 6GB in the 1TB storage SKUs, and 4GB for the rest – compared to 4 GB in the iPhone XS. This is far less than most laptops, which can offer 16-32 GB of RAM with the low-power CPUs. But iOS is certainly less RAM hungry compared to the PC, thanks to the more limited applications available, so RAM is not going to be a limiting factor in most workloads. 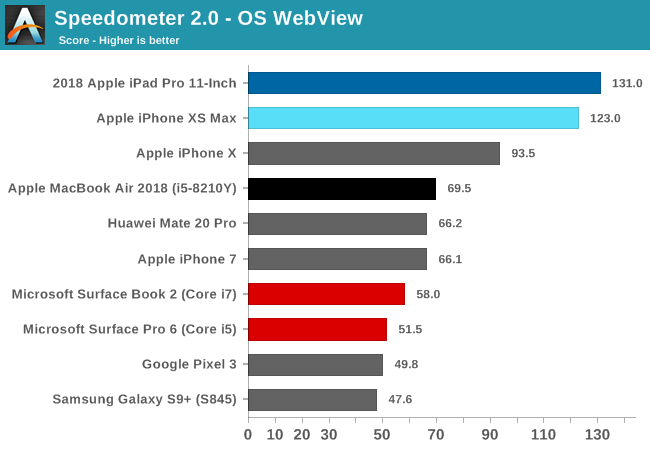 Ultimately, despite Apple stating the iPad is quicker than most laptops, it is generally difficult to compare across these platforms because the desktop tools we normally use don’t exist on iOS, and most iOS tools don't exist on desktop OSes. Plus the locked-down nature of the operating system means that even those that do exist generally have lower system access. But we do have some cross-platform tools available. First up is Bapco’s TabletMark 2017, which is their latest iteration of their cross-platform performance and battery life testing tool. The 2017 version has the Windows version written entirely using UWP, and tests two scenarios for performance. Web and Email is the first scenario, and Photo and Video Sharing is the second. Each platform uses its native APIs and tools. Scores are calibrated against the Microsoft Surface 3 tablet, with four Atom cores, and that model is scored to 1000. Systems that are twice as fast would score 2000, and so on. The benchmark is sensitive to both CPU and GPU performance, but the CPU tests are mostly single-threaded. In this test, the iPad Pro scores below the Surface Pro and Surface Book (which was run as iGPU only) which is perhaps not indicative of the actual performance of the iPad Pro, and once again points to the issues with testing cross-platform, even with companies doing their best to provide as fair of a comparison as possible. And with that single test out of the way, we’re already into web-based testing, which is important, but doesn’t really give a great look at the underlying hardware due to the scripting engine having such a profound impact on scores. The new A12X scores slightly higher than the iPhone in this test, but the two extra cores don’t offer a meaningful impact in performance in all scenarios. All of these results are well over the PC though, which struggles in this WebKit created benchmark. Our PC scores are done in the native browser, Edge, but even Chrome on the Surface Book 2 only scores 75.8. The latest version of Bapco’s web browser test is WebXPRT, and it offers quite a few different workloads compared to Speedometer. The performance on the PC surpasses the iPad in this test, but once again the underlying scripting engines have a large impact on the performance differences, which is why it is difficult to use these tests as a good cross-comparison. Once again you can see the combination of Apple’s Vortex CPUs combined with their scripting engine in Safari make for a potent combination, scoring well above any of the Windows 10 devices. Comparing it to the PC though is difficult, since there just are not a lot of good tools available. We will look into getting a proper SPEC comparison in the future which should give us a better baseline. Ultimately comparing iOS performance to the PC is similar to comparing it to Android, and you end up mostly looking at ECMAScript performance on the web. 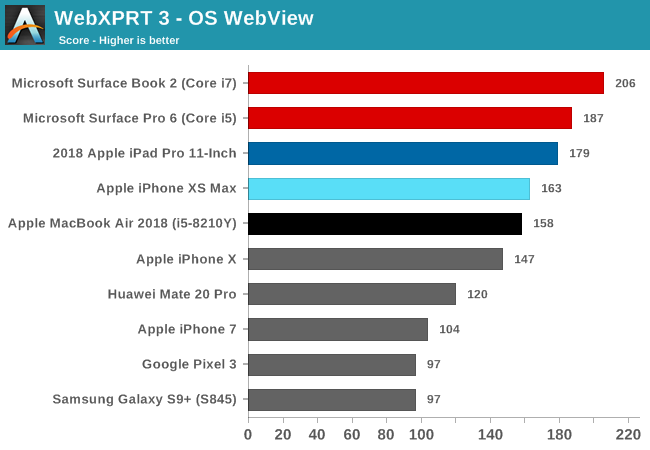 The SPEC results we do have now though show that the A12X is roughly on-par with the single-threaded performance of the iPhone XS, which isn’t really a surprise, but that the A12X is well ahead of other ARM based CPUs. We’ll need a bit more time to make the same sort of comparison to the PC.